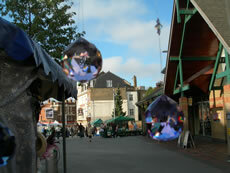 Since March Juma has been successfully trading each Saturday at Acton Market. Juma is the brainchild of Julie Worms who spent many years training in the art of jewellery design and creation. Having sold her early work at craft fairs Julie decided to “have a go” at a permanent stall. And with the help of Action Acton this dream was realised. There were certainly early teething problems an outdoor stall in the March winds and pouring rain was not easy. The stalls tended to “take off” in the wind and there was often a waterfall of water as the rain ran down the hill to Acton High Street. In fact combatting the elements and protecting the stock took more of her energy than selling in the early days. But with the coming of summer, and the various improvements made by Action Acton and Julie herself the stall started to trade successfully. The best part of having a stall is the buzz of the market, the banter between the stallholders and chatting with the customers. Many regular customers turn up every Saturday just to look over any new stock and pass the time of day. 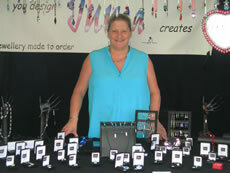 Julie likes meeting new people every week who take a great interest in her designs and creations. 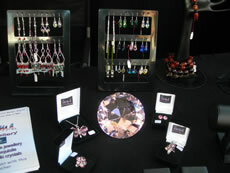 There is a very large range of jewellery displayed, all made by Julie herself. And the stall is becoming established as an oasis for those special presents and for those people who just cannot help buying items for themselves. As the market has grown, the number of customers has steadily increased and there has been a high demand for specially created jewellery to customer specification. Also Julie has had a very high number of requests for repairs to broken or damaged jewellery, which can bring back to life items that have laid unused in jewellery boxes for years. One customer had a broken pearl necklace that had not been worn for fifteen years. For a few pounds this was returned to its former glory and a delighted customer. Julie even has requests to recreate jewellery that has been lost. In one particular case a young lady had lost a bracelet, which had been given as a birthday present by her fiancée. Luckily the matching necklace had not been lost so Julie could create a new bracelet to cover the loss. The young lady was delighted, as she could avoid the embarrassment of telling her boyfriend of her loss and the match was so good the boyfriend was none the wiser. The new bracelet is now fitted with a safety chain. Juma uses a large range of precious and semi-precious materials and specifically genuine Swarovski crystals. Thus the stall holds a glittering display, which adds glamour to the market. Julie has over 150 different colours of crystals and each item on sale has been made to the highest specification. Julie looks forward to meeting you, should you get the chance of visiting her stall at Acton Market.